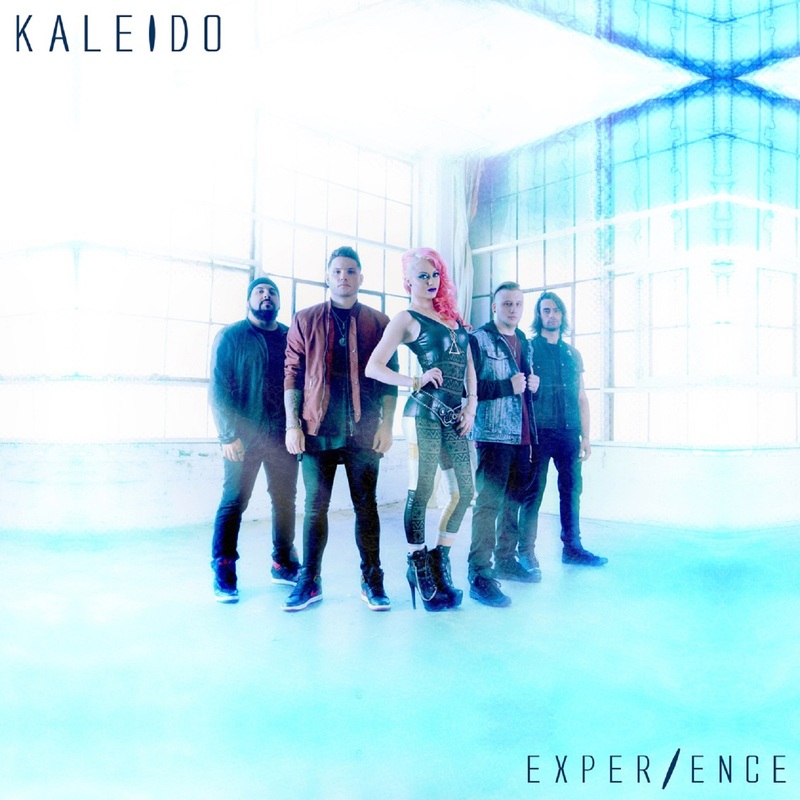 Detroit-Based Rock Group KALEIDO Discusses Their Debut Album ‘EXPERIENCE’, Working With Alien Ant Farm and More! 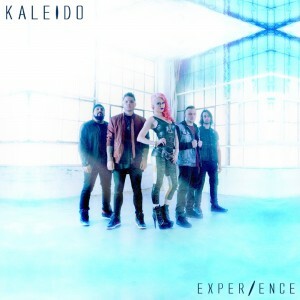 Kaleido is a Detroit-based rock group. Comprised of Christina Chriss (vocals), Joey Fava (drums), Ronnie Rosolino (rhythm guitar), Cody Morales (bass) and Zach Bolling (lead guitar), they are a fresh, modern day Detroit incarnation of rock n’ roll. Their 2017 debut full-length album “EXPERIENCE” is straight, unadulterated, feel it in your soul rock with flourishes of pop, R&B, punk & funk undertones – and hooks for days. 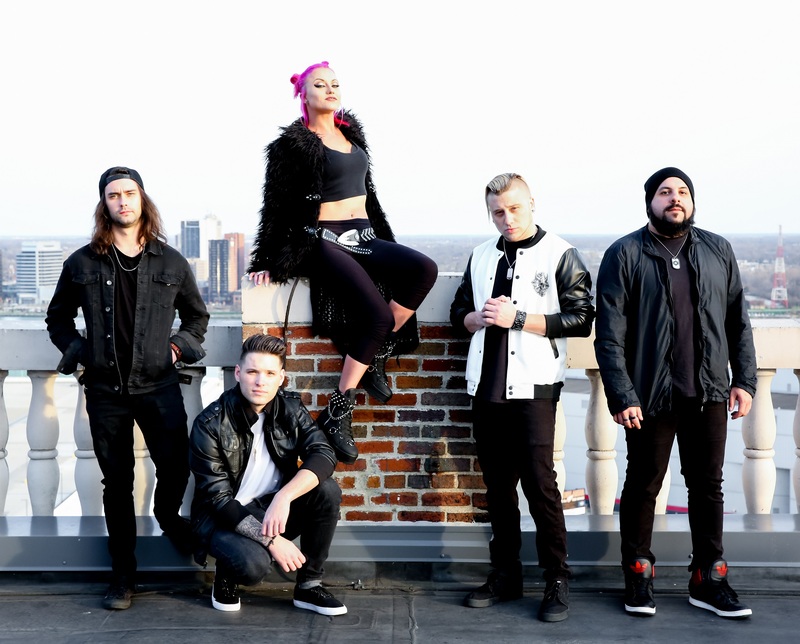 At the core, Kaleido is reminiscent of the piss-and-vinegar, stadium rock of a young Guns N’ Roses crossed and fused with the lovable, fun and energetic sensibilities of an early No Doubt. 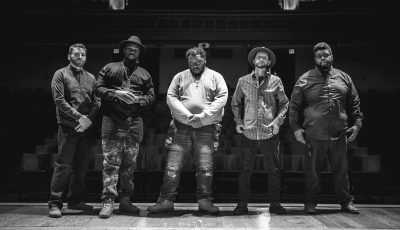 Their authentic and memorable songs are highlighted by an explosive live show, both of which quickly gained them notoriety in the Detroit music scene. Named Best Band in Detroit by Real Detroit Weekly in both 2013 & 2014, plus having won two Detroit Music Awards in 2015 for “Outstanding Rock/Pop Group” and “Outstanding Rock Recording” for their second independent EP ‘Unbreakable’, they have since taken the show on the road, lighting up stages on the Van’s Warped Tour, Rockstar Uproar Festival, Summerfest & CMJ Music Marathon and opened for Aerosmith, Slash, Kid Rock, The Offspring, Sammy Hagar, Evanescence, Halestorm, Ace Frehley of Kiss, Twenty One Pilots and countless others. Kaleido recently wrapped up their latest US tour with groundbreaking rock legends Living Colour and their first tour of the United Kingdom with Alien Ant Farm and Hed PE in October 2016. The first single released from “EXPERIENCE”, titled “Love & War” (co-written and featuring Dryden Mitchell of Alien Ant Farm), won an unprecedented 27 nights on 89x The New Rock Alternative People’s Choice, and was consequently retired as the most winning song of all time on the station. “Trouble In Paradise”, the second single, combines hard hitting 808’s, pounding live drums, a bouncy rhythm, beautifully eerie vocals, soaring melodies and harmonizing guitars with a funky reggae inspired bass line. “Trouble In Paradise” blends and bends genres, creating a fresh, new sound. The new single “Die Tryin” is a rock anthem to stepping up to the plate, taking your swings – and never backing down form a challenge. Kaleido is on tour with Seether in May and June and Rob Zombie in July. What are some words you would use to describe the past year for this band and your music? What were some of the highlights? A few words to describe the past year are Progressive, evolutionary, rewarding & fun! What has been the most exciting part about 2017 so far? The tour with Seether that just began a few days ago – The first 2 shows were absolutely incredible, and sold out! Also, having the new album finished and ready to reveal to the world. Growing up, did you all always want to be musicians? Can you recall the moment you realized that you could really make music together and be a band? How did you all first meet each other? Christina Chriss: We all knew from an early age that we wanted to be musicians. My mom saved a paper I filled out in school when I was 7 years old that asked what I wanted to be when I grew up. She found it recently and shared it with me. My response: a singer! I made up my mind then and never changed it! We all met in the local Detroit music scene playing shows. Cody Morales (Kaleido bassist) and I were in a band together and met Joey Fava (Kaleido drummer) when our bands played together on the same bill. We hit it off right away and started writing together. I had been doing some cowriting in the studio with Mickey Avalon at the time and he invited me to open for him at The Roxy in Hollywood, CA in 2011. I asked my friend Ronnie Rosolino (Kaleido guitarist) to come play the show with us. We had just a few songs written and were unnamed at the time, but we flew out to do the show anyway. The incredible energy we had together was effortless and instantaneous, and I knew after that show that we had a special connection. We went back to Detroit, named ourselves Kaleido and got to work. Was it hard to narrow down a band name? How did you finally decide? What other names were you considering? Christina Chriss: I like to say that the Universe named us. We were driving to the studio to record one of our early songs after returning from California and I was looking out the window daydreaming about life, existence, (all the things that blow your mind when you think about them too hard). Suddenly KALEIDO popped into my head. I know that I had tossed out a few band name ideas prior to that and the guys hated every one. I can’t even remember any of them so obviously it was for good reason! But when I said “what about KALEIDO?” that day .. they didn’t hate it! They were quiet for a few seconds then said that they liked it. And it stuck. On May 19th you released your debut full length album, “Experience.” Can you talk about what it was like putting this collection together? How long did the whole process take? Christina Chriss: We worked on “Experience” for over 2 years between writing and recording it. We set out to capture the sound and energy we have live, so we produced it ourselves to keep it authentically Kaleido. “Experience” is a concept album, it tells a story from beginning to end of the Experiences we have collected along the way. 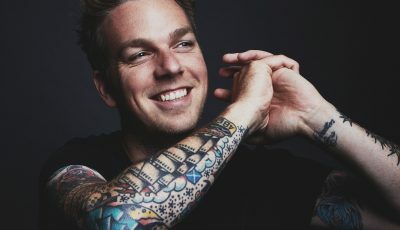 What was it like working with Dryden Mitchell of Alien Ant Farm on your first single released from this album, “Love & War”? Where did the inspiration for the track come from? 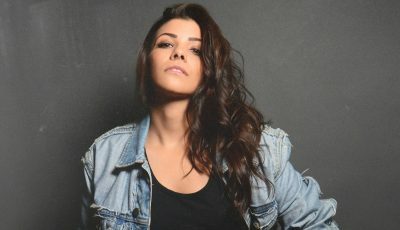 Christina Chriss: First, I want to say that Dryden and all of the dudes in Alien Ant Farm are some of the best friends we have made in the industry so far. They popped our tour cherry on 2 continents!, Haha! First in the US, and then this past year in the U.K. They’re like family. We’re very comfortable with each other, so it was really awesome to finally be able to sit down and create together, and “Love & War” is what came out. A side note as well – during this same time working together, Mike Cosgrove (AAF drummer) recorded our latest single “Die Tryin'”, which is also on our new album. You have a pretty busy touring schedule coming up this summer with Seether and then Rob Zombie. Where are you looking forward to playing at? Is this the first time that you have played at some of these venues? How do you keep up the energy night after night? Do you have interesting rituals you must do each night? Christina Chriss: We’re looking forward to every show! A couple places we’ve played before, but there are a lot of new ones too. We are especially looking forward to back-to-back shows with Seether in our hometown, Detroit. We love what we do more than anything, the passion provides the energy night after night. Where do you guys think you are happiest- recording in the studio, playing live or elsewhere? Kaleido: LIVE, ALL DAY! We feed off the energy of the fans, who have been so supportive all along the way. Who are some of your favorite artists? Who would you all to work with in the future? What would be a dream collaboration for each of you and Kaleido? Kaleido: So many favorites! We love Guns N Roses, Foo Fighters, Van Halen, Blink 182, Metallica, Bring Me The Horizon, Bruno Mars, Prince, Patsy Cline, Rihanna, Kid Rock, Bob Seger, Tom Petty, The Eagles…. we could go on and on! We’d really love to collaborate with any of our musical influences, but it would also be really cool to collaborate with Mark Ronson, who is a very diversified producer. Dave Grohl would be a blast to work with too. At the end of the day, what do you hope is the message of your music? What do you hope people take away from your songs? Christina Chriss: Enjoy your life, enjoy the experiences, the ups, the downs, soak it all in and never stop learning! We hope that our music gives that special feeling you can only get when you listen to a song that hits close to home. Brooklyn Electro-Pop Musician VACANCES Discusses His Newest Music and More! An Interview With The Indie-Comedy Band, THE FIRETURTLES!